Everyone of us heard about ginseng root and its miraculous effects as a powerful natural aphrodisiac and tonic. Ginseng is a nutritious herb, which grows in many countries of the world and has a variety of types. There is Siberian Ginseng (Eleutherococcus Senticosus), Asian Ginseng (Panax Ginseng), Jiaogulan or Southern Ginseng (Gynostemma Pentaphyllum), Japanese Ginseng (Panax Japonicum), Indian Ginseng (Withania Somnifera), Brazilian Ginseng (Pfaffia Paniculata), Peruvian Ginseng (Epidium Meyenii), American ginseng, etc. Improving endurance and restoring energy. Reducing physical and mental stresses, anxiety and nervous tension. Improving abilities to focus and memory. Acting as an effective sleep aid. Improving sexual function as an excellent natural aphrodisiac. 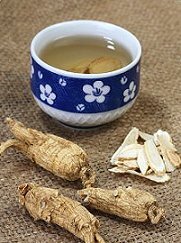 To enjoy these numerous health benefits of ginseng, you can buy a dried out ginseng root (whole or sliced), a ginseng supplement or any type of ginseng tea in herbal store. This natural remedy is considered to be quite safe, but pregnant and breastfeeding women are recommended to avoid using it. Consume ginseng tea on a regular basis, and you’ll feel stronger, more energetic, more focused and healthy! This entry was posted 8 years, 9 months ago.